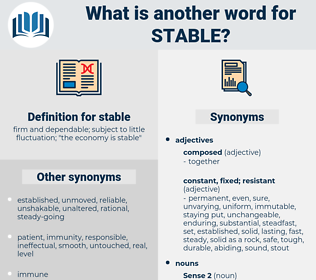 What is another word for stable? 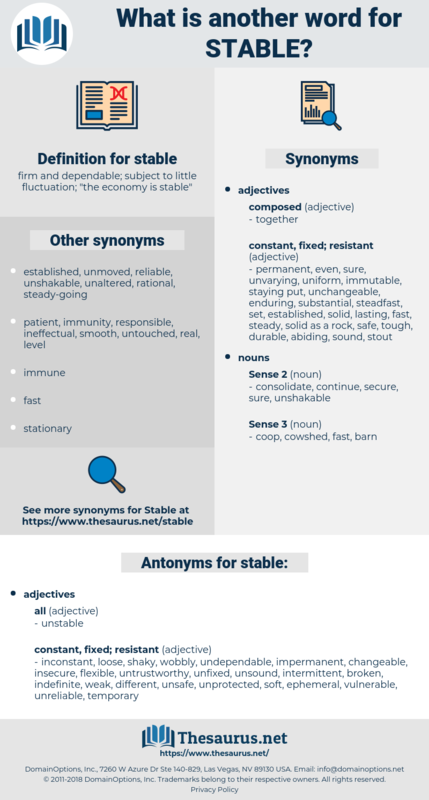 firm and dependable; subject to little fluctuation; " the economy is stable"
as good as your word. constant, steady-state, reliable, steadfast, stationary, static, stability-oriented, self-sustaining, stagnant, viable, immutable, destabilizing, sound, sturdy, precarious, status-quo, continuous, fragile. stabilised, sustainable, consistent, strong, lasting, durable, predictable, stability, well-established, sustained, healthy, volatile, balanced, stabilized, regular, flat. stability, livery, stabilization, barn, flat. impermanent, flexible, unsound, soft, indefinite, changing, loose, vulnerable, wobbly, inconstant, weak, unsafe, imbalanced, changeable, ephemeral, untrustworthy, undependable, intermittent, shaky, broken, irresolute, unprotected, different, unfixed, insecure, unreliable, temporary. eccentric, momentary, wacky, brainsick, loopy, mad, screwy, monomaniac, nutty, amok, moonstruck, wacko, bananas, psycho, disturbed, berserk, crazed, monomaniacal, fleeting, obsessive-compulsive, transitory, unspecified, daft, transient, negotiable, ballistic, off, frenzied, loco, reactive, delirious, maniacal, paranoiac, disordered, oddball, strange, haywire, bughouse, unsubstantial, batty, frantic, open-ended, tipsy, insane, crackpot, crackbrained, mixed-up, meshuga, distraught, Daffy, schizophrenic, paranoid, gaga, kaleidoscopic, deranged, depressed, crazy, mental, evanescent, cracked, infirm, lunatic, nuclear, odd, fixated, delusionary, loony, irrational, senseless, aberrant, witless, balmy, raving, hysterical, certifiable, potty, neurotic, cuckoo, distracted, foolish, unreasonable, nuts, scatty, ape, demented, phantasmagoric, fruity, dotty, psychotic, obsessed, delusional, schizoid, despondent, pixilated. If he did thet he'd charge us fur stablin' his own team in his own stable, and likewise fur your grub and his'n. The great stable was a very pleasant place these spring days. sheath pile, sextuple, stiffly, see double, stabile, setubal, staple, shadblow, shadfly, south pole, suitably, St. Paul, stubble, satiable, suicide pill, stubbly, styphelia, stuffily, sheet pile, suitable, stipple, steeple, stifle, sight bill, suggestible, she-devil, seed weevil, stapelia, stipule, staphylea, stoppable, shadow play, stopple.